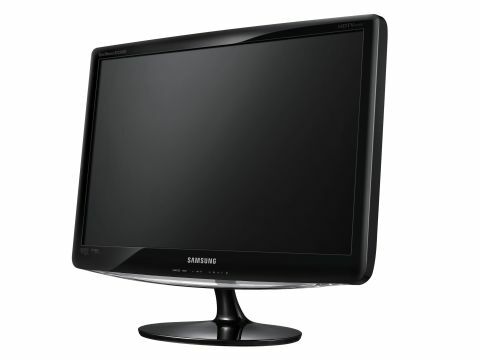 Can TV and PC monitor coexist in the Samsung B2330 HD? The Samsung B2330HD is the latest in an increasing market of TV/monitor combosm, aiming to combine the televisual excellence of the LCD TV with the convenience and clarity of a PC monitor. Like its competitors, the Samsung B2330HD offers a plethora of connectivity, from SCART, HDMI, DVB-T and VGA. Basically it can handle pretty much anything you can throw at it. The 23-inch 16:9 panel offers a whopping 70,000:1 contrast ratio, which rivals most TVs, demonstrating the great leap forward in the quality of dual action TV monitors. That though is a dynamic ratio. Samsung's B2330HD also features technology such as Picture in Picture, where you can have a TV screen displayed while working from a different source. What's more, there's a remote control for easy switching between modes, so it's simple to sit back and enjoy TV and movies. And you've also got the ability to play content from USB media. Despite the Full 1080p HD credentials of the Samsung B2330HD, there's no actual Freeview HD built in, although one could be connected to one of the HDMI ports if required.